Drama. Analysts and investors continue to worry about the “earnings”, every quarter, quarter after quarter, in the same way that we might “worry” about our children’s report cards or the box scores at the ball game. But in neither of those cases are we going to sell or write-off the team. And the same can be said for the “earnings” of a company – they’re irrelevant. It’s more than enough if they’re positive, and they’re trying with some success, but even negative earnings don’t necessarily affect the stock price in a negative way (consider the “concerns” of TheStreet, April 18, 2013, IBM Slides as Weak Yen Crimps Earnings, and three months ago, Reuters, January 22, 2013, IBM fourth quarter earnings, revenue beat Street). For more examples, please see our previous Post, (B)(N) PEP PepsiCo Incorporated, April 2013, but if your boss or clients are still fascinated by the “earnings” and pinning their fortunes on them, then there is a small research programme that will show them that “Earnings Are Irrelevant” to investment success (please see below). 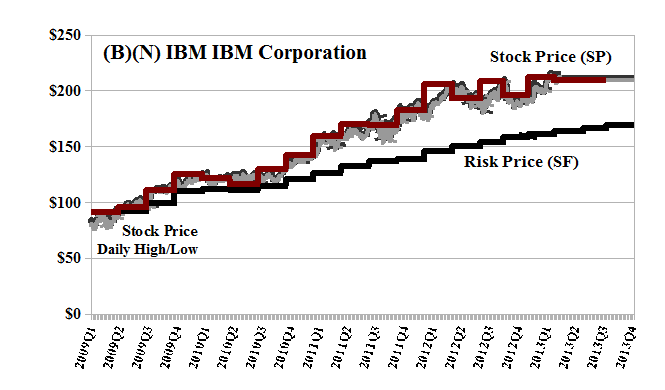 Regardless of the “earnings” (and we don’t know what they are or what to make of them), IBM has been in the Perpetual Bond™ every day since $90 in 2009, and is in the Bond now at $207 (please see Exhibit 1 below) because the Red Line Stock Price (SP) is above the Black Line Risk Price (SF), and that’s the only reason. The current dividend is $0.85 per share per quarter or $3.7 billion per year that is paid to the shareholders for a current yield of 1.6% (but much higher for us because we bought the stock at much lower prices). Our estimate of the downside due to the demonstrated volatility of the stock price is minus ($8.50) so that we would be indifferent to any stock price between $199 ($207 less $8.50) and $215 (apart from joy); the former stock price, $199, doesn’t really matter either because it’s still well above the Risk Price (SF) of $168. On the other hand, if we don’t want to be sold out by a stop/loss at $199, then we could think about buying a “collar” on the stock price. For example, the July put at $205 is available for $8.15 per share today and the cost of that can be partially offset by a sold or short call against our long position at $210 which sells for $6.80 today, or at $215 which sells for $4.80 today. We’re thinking about July because, of course, there’ll be another earnings report and rumors thereof, and for a net cost of $1.35 today ($8.15 less $6.80), we won’t care; we can collect our dividends and we are guaranteed no less than $205 and no more than $210 for our stock, unless we roll the “collar” forward and upward in the meantime. where the [PE] is the “price to earnings multiple” that is normative in some sense, such as deemed typical of the industry or that class of company; typical PEs might be 10 or 20, and are carefully studied and tabulated for industries. The EPS is the “earnings per share” taken on an annual basis, so that quarterly earnings per share are often extrapolated into annual earnings per share, using all the information that becomes available from the preceding quarterly and annual reports, and pondering the future. is a utility function of von Neumann-Morgenstern type (please see our Post, The Price of Risk, August 2012, for additional references). We can say then that a current stock price, SP, has “positive utility” if it exceeds the “risk adjusted price”, SF, and “negative utility” otherwise. It’s all that because investors take the EPS as a measure of “risk aversion” – the more EPS, the better, and an increase or decrease in EPS is (obviously) significant to them. But is it significant to their investment success? Does it mean that their capital is safe and that they might receive a hopeful return above the rate of inflation? To test that hypothesis, track the performance of portfolios of stocks that demonstrate positive utility – call them (B) – and portfolios of stocks that demonstrate negative utility – call them (N). To avoid “cheating”, a company must be either a (B) or an (N) at any time (but not necessarily the same (B) or (N) at all times) and all companies in a “market” or domain such as the Dow Jones Industrial Companies must be so assigned. Moreover, a company that is deemed to make an (N)- to (B)-transition, must be bought at that price (the (B) price), and a company that makes a (B)- to (N)-transition must be sold at the (B) price (because of price protection), and to avoid unnecessary and specious turnover in the portfolio, apply some rule such as “once deemed a (B) it must stay a (B) for the next three months or the next week or so” and the same for the (N)-companies (which is reasonable because new earnings reports are not available more frequently and, therefore, the SF price is constant for some period of time). Using the same setup, we can also test another hypotheses that doesn’t work – “buying low and selling high” doesn’t work. To test that, we only buy and hold stocks that are in (N) and we sell them at the (B) (or “high”) price on an (N)- to (B)-transition, and buy them at the (N) (or “low”) price on a (B)- to (N)-transition; and we further note that “low” can be induced by “low PEs” regardless of the EPS. Finally, using the same setup (and this will break some hearts), we can show that the Capital Assets Pricing Model (CAPM) doesn’t work. To do that, replace SP and SF by the investment returns so that SF is the expected or demanded return for the stock in some period, and SP is the actual return in the same period, and again, for every stock in the domain. For an example of the results using the Risk Price (SF), which also has “all that” and actually “works” but doesn’t use EPS as a measure of risk aversion, please see our Post, Stock Prices Are The New Pink, June 2012. Portfolio and cash flow results using our “One Rule” are shown in the recent Posts, S&P TSX Winners & Losers, April 2013, The Dow Transports, March 2013, or The Wall Street Put, March 2013, or The Risk Adjusted Dow, March 2013, or The Canada Pension Bond, February 2013, and those data are available in machine-readable form at no cost from The RiskWerk Company.